Our volunteers personally load, unload and deliver donated items. But shipping costs are at least $1600 for each roundtrip voyage. We make approximately a minimum of one shipment each month to House of Hope. 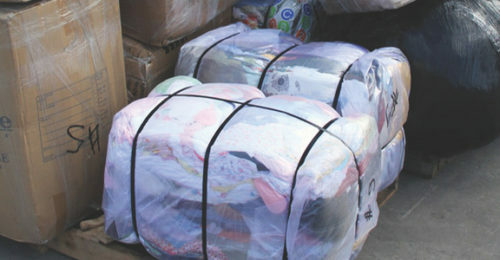 If 160 people contribute just $10, we can deliver baby formula, clothes, shoes and other donated items to the children. Just as important, the fact you care enough to donate tells these children they count. Very few goods are available locally, especially items such as infant formula, diapers, and children’s vitamins. Because most goods are imported, the cost to buy them locally is far more than the cost of shipping them into northwest Haiti. However, shipping to northwest Haiti is not easy because there is no modern port. The sea route can be treacherous and plagued by storms for six months of the year. Further, many charitable organizations are unable to ship and distribute goods to the people in Haiti because there are problems with theft and diverted distribution. There is sentiment against giving to Haiti simply because other organizations have failed to deliver aid to those most in need. We are a small organization with direct knowledge of the northwest Haiti and “how things work.” We have the connections needed to ship and distribute goods reliably in northwest Haiti. We do participate in every stage of the logistics to make sure all donations go where you intend them to go. We make sure those in need – the children of House of Hope – receive your donated items and they never wind up “diverted” to the local black market. Friends of Humanity volunteers. Depending on oil prices and the time of year, the cost to send a shipment to House of Hope is around $1600 to $3000.